The wife of the All Progressives Congress (APC) governorship candidate in Lagos State, Dr. Ibijoke Sanwo-Olu, has said retired medical practitioners would be engaged to achieve efficient healthcare delivery in the state, if her husband is elected, reports ITREALMS. Mrs. Sanwo-Olu, who is a medical practitioner, said improved healthcare would be a major programme her husband would be bringing, saying the experience of the retirees would be harnessed to solve the challenges facing healthcare delivery system in the state. Mrs Sanwo-Olu revealed that her husband always became emotional for the “overwhelming support” he enjoyed from various groups across the divides, saying the support would not be taken for granted. 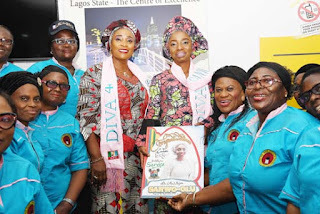 Women in Entertainment, led by Mrs. Wunmi Obe, said Sanwo-Olu’s zeal to address challenges facing the entertainment industry led to his endorsement by the group. Members of Conference 57 for Women Affairs and Poverty Alleviation (WAPA) said they were convinced Sanwo-Olu’s programmes were designed to tackle poverty at the grassroots. WAPA’s supervisor, Mrs. Pat Tekoboh, said the group was ready to mobilise voters for the election of the APC candidate at the polls. She, however, urged Sanwo-Olu to appoint women in key areas if elected. Other groups that visited the campaign office included Network Men and Women Group, Sanwo-Olu Babes in Surulere, and Female Councilors’ Forum, among others.